Accurate data about foundation of the town do not exist, but this place has been already settled in the era of the nation migration and according to legend this town had got its name from the Arpadian Captain Meger who had settled down with his folk in Žitný island. 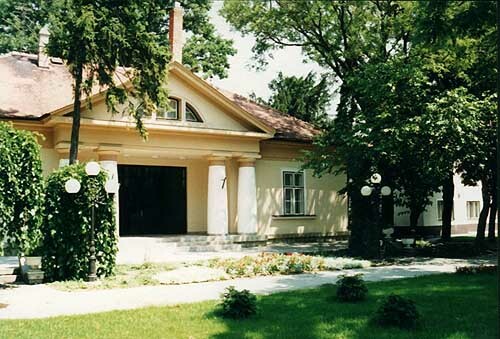 The first written mention of the town originates from the year 1268 from the pergamen of the king Béla IV.th as a property of the castle county in Komárno under the name VILLA MEGER. In the year 1421 the king Žikmund of Luxembourg had exchanged Veľký Meder for another property with Stephan and John Kanozsay, but in the year 1460 Veľký Meder had become again the property of the Komárno county. The written documents confirm King Matyas Hunyady called Corvinus awarded Veľký Meder municipal privileges the 15th of December 1466. According to these privileges the town had achieved right to organise three markets yearly and enforcement of criminal law. The king Matej II.nd awarded the town privileges in form of inhabitant liberation of toll and charges. 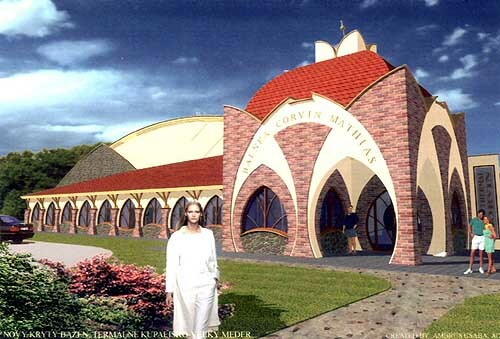 The town was suffering because of invasion of Turks. In the year 1702 conflagration broke out which had destroyed almost entire city. It had burnt out the town hall and a great deal of rare historic documents had been annihilated. In the year 1710 plague and in the year 1831 cholera had marauded. In the era of the Hungarian National Uprising the town was enfeebled by feeding the military and in the autumn of the year 1849 cholera broke out again. At the end of the previous and at the beginning of the 20th centuries were founded several guilds. The most well-known had been the weaving guild. In the year 1920 existed here a printer station. Horrors of the First World War are mentioned by cemetery of Serbian soldiers with mass graves. Monument for victim of the World War II was unveiled in the year 1991 at the Heroes place. 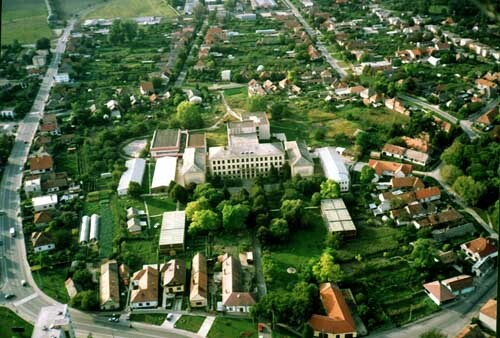 Town Veľký Meder with its 10 000 inhabitants is situated on the foot of Western Slovakia at the international traffic transit Bratislava – Györ, 10km from the frontier crossing in Medveďov. The town since 1970 is getting into awareness thanks to its thermal swimming pool. 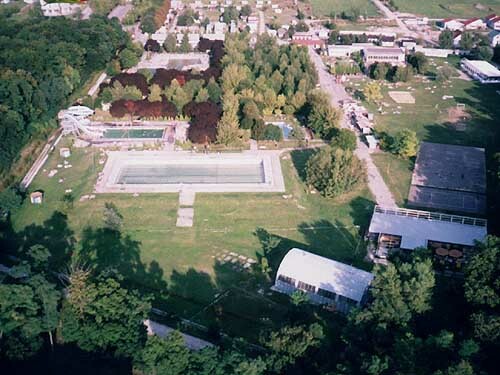 This swimming pool constructed in the year 1973 offers year-long services in its combined roofed basin with connection on the exterior basin in an especially noteworthy area of glowing steam of thermal water in the winter-time. 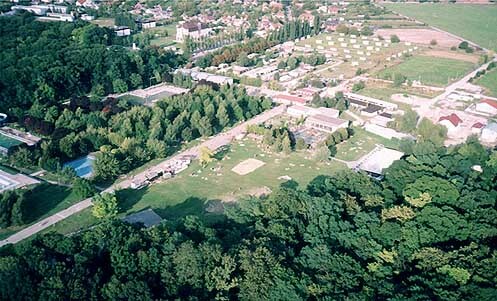 The town as an exclusive owner of the area (thermal swimming pool - TSP) had decided to invest in development of this zone and had confirmed the project of constructing a new roofed field equipped with a basin of an area 300m2 in atypical form, with a baby and eddy basin, sauna, press and new large cloak-rooms with fiscal costs 20 million Sk. During the year massages are ensured. In the summer-time we will offer you services in other four basins: baby basin of water temperature 30 degrees Celsius, recreational basin of water temperature 33 degrees Celsius, basin 25m in lenght – “italian”of water temperature 28°C, basin 50m in lenght – “swimming”of water temperature 25°C. According to the experience of doctors the chemical composition of geothermal water has favourable effects on healing of joint affection, backbone and muscural fatigue and as a whole contributes to the recovery of organism. Entire area of swimming pool is situated in forest surroundings with an acreage of approximately 100ha and offers some opportunities to wandering and jaunts along the cared woodpathes. 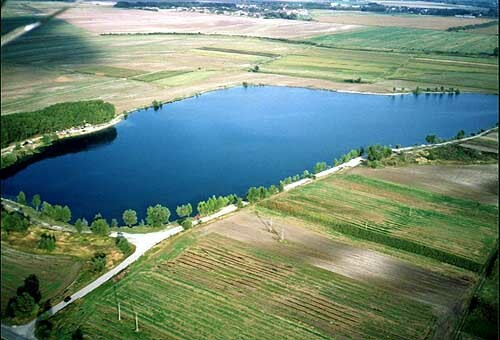 For lovers of water sports offers good conditions a popular recreational place of town inhabitants and returning tourists, lake – gravel lake near the city with its 20ha water area and beautiful crystal clear water. In the area of thermal swimming pool you can eat in cafeterias, in restaurant Thermál and you can take advantage of lodging in hotels: Thermál, Medmilk, Recreational centre – Lesopark and in auto-camp direct in the area. In addition to this accomodation is offered by private entrepreneurs in boarding-houses and in camps in privacy in the town. The capacity of swimming pool is 5500 persons a day. The town except autotourists is accessible by bus and train (Bratislava – Komárno) for every person interested. Our town welcomes every visitor longing for warm sunny weather, strenghtening health, vacation and entertainment.